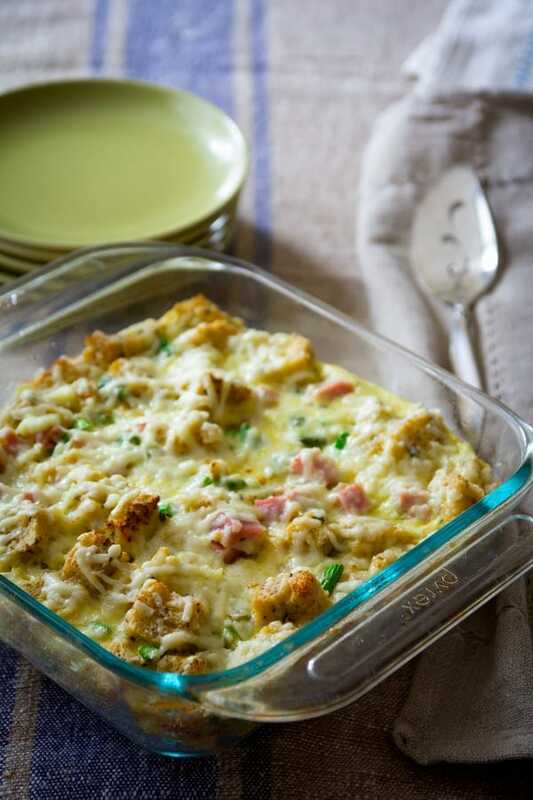 Easy savory bread pudding with fresh asparagus, smoked ham and cheddar for an easy dinner or Easter Brunch. I wanted to share this recipe with you this week for two reasons. First, because Easter is coming up soon, and I wanted to be sure you put it on your Easter menu. It is so easy and it is absolutely perfect for brunch. The best part is that you can do a lot of it ahead. Just prepare it through step two a day ahead, and refrigerate it until about an hour and a half before you want to eat. 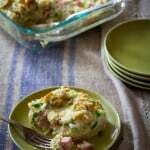 I use this same formula to make all kinds of variations on the savory bread pudding theme, I just mix-up the add-ins with whatever is in season. I use other cheeses, vegetables, and meat. Also, feel free to double it, and bake it in a 9 by 13-inch baking dish if you have a crowd to feed. This recipe will be one you use over and over. The second reason is that I cooked this recipe for a cooking video. You can see me in action and see just how easy it is. See? It is so easy to make. So as I was saying, I did the video for the New England Dairy and Food Council and now I am gearing up for another fun project with them. 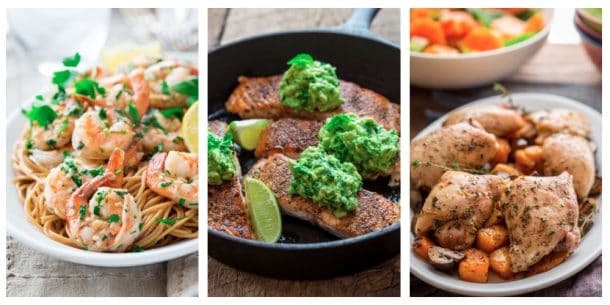 This month I am going to be cooking in my first live cooking demo for a fabulous group of registered dietitians for the annual meeting of the Vermont Academy of Nutrition and Dietetics. High fives! I am so excited to cook for them, and show them three healthy recipes I developed for the occasion. I have so much I want to say, getting it all down to an hour will be a challenge for this chatter box. I got to starch up my chef’s whites to be one of the judges in the Vermont Junior Iron Chef cooking competition. It is put on by Vermont FEED and the Burlington School Food Project. It was stunning! You can see photos from the event here taken by my friend Vera Chang. It was so cool to watch hundreds of kids working so hard on making healthy food for the event. After observing the competition and making notes about the individual teams mise en place. The judges headed back to the judging room for tasting. And taste we did. I got to sit next to my friend Eric who is the chef owner at the best restaurant in Vermont. We had so much fun identifying the various flavors in each dish and choosing our favorites. With kids learning about cooking from scratch and healthy eating there were only winners. Some healthy food bloggers and I have teamed up to create a recipe sharing group on Facebook. You are invited to join us. The bloggers will post recipes to keep you inspired, and as long as you’re a member, the recipe links will appear in your news feed. Here is the link, just join and enjoy being inspired! My new friend Emily of Jelly Toast Blog and I have started a fantastically exciting project!!! There will be more about it soon, but for now, I’ll give you a little sneak peak. It is called “Focus on Photography Challenge.” We’ve started out with a group of twenty food bloggers who are interested in expanding our photography and styling through fun group monthly challenges. Our first challenge will be this month. More on that soon. Last but not least, if you scroll all the way to the bottom of the page there is a new badge down in the footer. Yep. You’re lookin’ at the newest client of the Lisa Ekus group! For realz! Bursting!!! 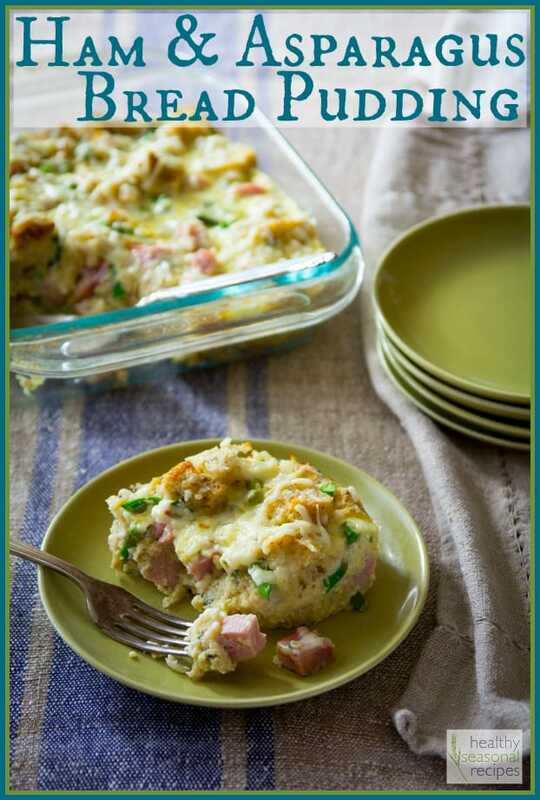 Easy savory bread pudding recipe with ham and asparagus perfect for Easter brunch or a simple dinner with salad. Preheat oven to 350 degrees F. Coat an 8 X 8-inch baking dish with cooking spray. Whisk eggs, egg whites, milk, Dijon, thyme, salt, pepper and garlic powder in a large bowl. Add bread, ham, asparagus and ¾ cup shredded cheddar or Swiss cheese. Stir to combine. Transfer the bread mixture and custard to the prepared dish. Cover with parchment and foil. Bake until almost set-up in the center and steaming hot, 32 to 36 minutes. Remove foil, top with the remaining ½ cup cheese and bake until puffed and golden on top, 15 to 20 minutes longer. Sat Fat: 6 grams. Fiber: 2 grams. Protein: 19grams. Sodium: 742 mg.
that is SO exciting re: Lisa Ekus, congrats girrrl!! What a wonderful thing to celebrate 🙂 absolutely love that you added asparagus to the mix here, this recipe looks divine. Lots of incredible stuff happening with you right now, so go get it chica! 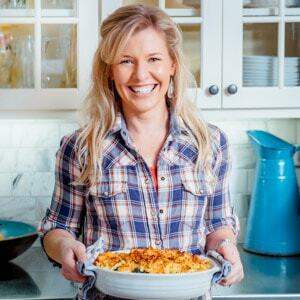 I always prefer savory bread puddings over sweet ones and this one so got my attention, Katie! Ham and asparagus? What’s not to love! I loved watching the video. It’s always fun to see someone live that you’ve only known online. And…big congrats on getting an agent!! Thank you and thank you. I agree about watching videos of online friends. I hope to start adding more videos to posts soon. It is too fun! Asparagus and ham, delicious recipe! I’ve yet to try making a bread pudding… but I really have always wanted to. Now I’m wondering why I haven’t. You make it look so easy in the video! Thinking I may have to give this a try for our Easter brunch!